Putting a live plant in your hamster's cage may seem like a good way to add a little bit of the outdoors to your indoor pet's daily life, but for many good reasons, it's an unusual practice. It is important to choose every component of a hamster cage carefully to ensure it is both safe and functional for your pet. Even nontoxic plants are not are not terribly practical. Hamsters eat plants, so any plant you decide to place inside the cage is likely to get eaten by your pet. If the plant is even mildly toxic, it could cause serious health problems. Even nontoxic plants can cause an upset tummy if your hamster consumes too much. Eating plants in the living environment can also cause a dietary imbalance if your hamster decides he'd rather eat the plant than his food. A large number of plants are toxic to hamsters, so check with your veterinarian before introducing any live plants to your pet's habitat. A plant may make your hamster's cage more attractive to you, but even a small houseplant is significantly larger than your hamster and will likely take up quite a bit of the space available in the cage. 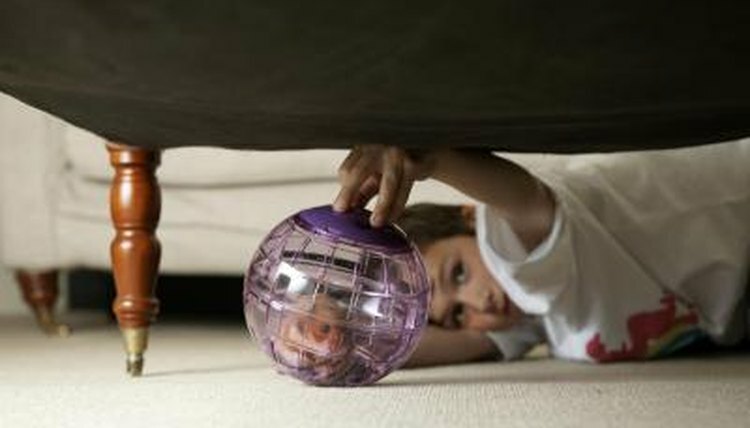 Hamsters need plenty of room to run; otherwise they can suffer from stress and immobility caused by a lack of exercise. Every item in your hamster's cage should provide a useful function to your hamster, or it is not worthy of taking up room inside the living enclosure. Many hamsters like to climb, and they'll climb pretty much anything you put in their cages, including live plants. But few living plants suited to a terrarium make for sturdy climbing. Your hamster can get hurt if he falls out of the plant while climbing it. Even if your hamster is not injured during climbing, he could use the plant to reach the top of the cage and escape. A living plant will need soil, sunlight and daily watering to survive. You will need to be very careful that you do not put your hamster in a situation where he could overheat while you are trying to give the plant enough light to survive. Hamsters do not do well in direct sunlight -- so any plant you place in a hamster cage needs to be able to survive without direct sunlight. If the plant needs to be fertilized, you risk exposing your hamster to those chemicals. You will not be able to use any kind of pesticide on the plant, because it will put your hamster at risk when he nibbles on it. Live plants are not popular in cages because of the problems they can cause and because of the amount of maintenance they require. If you do decide to put a live plant inside your hamster's cage, you will need to be prepared to pay a lot of attention to both the plant and the hamster. Consult your veterinarian before deciding to put any type of live plant in your hamster's cage to make sure your veterinarian believes the plant can benefit your specific animal and will not pose a danger to your hamster. It needs to be too small for your hamster to climb and to take up minimal floor space within the cage. It has to be nontoxic and preferably unappetizing to your pet, otherwise he may choose to consume the plant rather than the food you give him to eat. Be prepared to check the plant daily to make sure your hamster is not eating significant quantities of its vegetation. Be prepared to remove the plant from the cage if any problems arise that could put your hamster's health in danger.